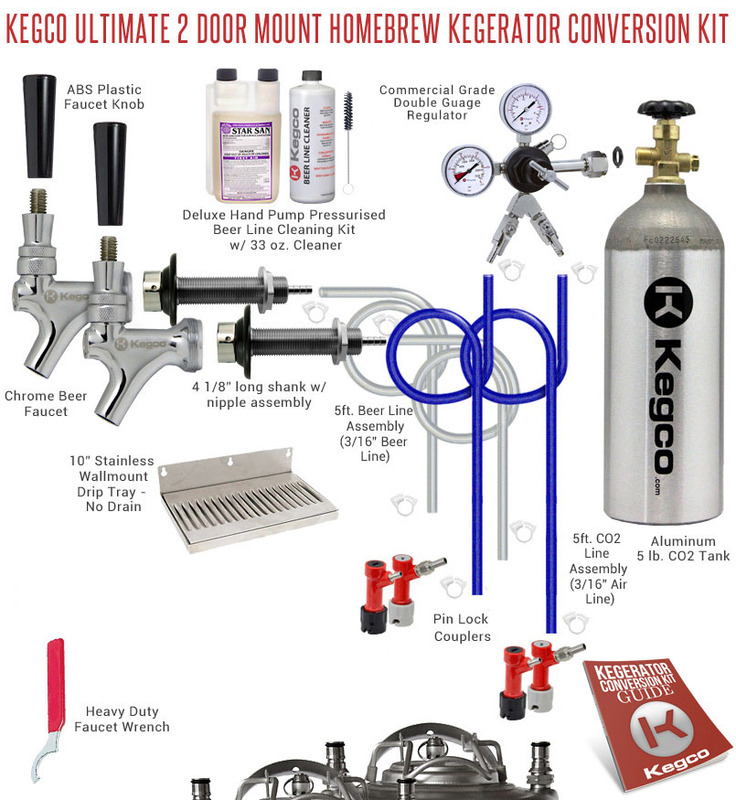 From assembling your very first piece to cleaning up after your very last pour, Kegco is with you every step of the way with the Ultimate Homebrew Two Keg Kegerator Conversion Kit. Made up of superior quality commercial-grade parts like an NSF-approved dual gauge two product regulator, pin lock keg couplers, and a lightweight 5 lb. CO2 tank made of high strength aluminum alloy, Kegco has thought of everything you'll need to convert a refrigerator or freezer into a high performance two product homebrew beer dispenser that has been designed and built to last. We've even included a stainless steel drip tray for easy clean-up and a 32 oz. bottle of beer line cleaner, 16 oz. bottle of Star San sanitizer, and faucet brush to keep your dispense system squeaky clean between kegs. Just follow the simple detailed instructions that are included in each kit, and before you know it you'll have a quality kegerator that can dispense up to two kegs of delicious home-brew beer! This NSF approved two product regulator has been specially designed to deliver reliable peak performance even in demanding commercial environments, and has been durably constructed for a consistent flow pour after pour. It features a T-Style adjustment valve that makes it easy to adjust the pressure in the keg, and dual gauges indicate both how much CO2 pressure is inside of the keg and how much CO2 gas is left in the cylinder.